For the 1999 C-SPAN series, see American Presidents: Life Portraits. For other uses, see President of the United States (disambiguation). The presidency of William Henry Harrison, who died 31 days after taking office in 1841, was the shortest in American history. 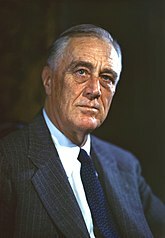 Franklin D. Roosevelt served the longest, over twelve years, before dying early in his fourth term in 1945. He is the only U.S. president to have served more than two terms. Since the ratification of the Twenty-second Amendment to the United States Constitution in 1951, no person may be elected president more than twice and no one who has served more than two years of a term to which someone else was elected may be elected more than once. Of those who have served as the nation's president, four died in office of natural causes (William Henry Harrison, Zachary Taylor, Warren G. Harding, and Franklin D. Roosevelt), four were assassinated (Abraham Lincoln, James A. Garfield, William McKinley and John F. Kennedy), and one resigned (Richard Nixon facing impeachment). John Tyler was the first vice president to assume the presidency during a presidential term, and set the precedent that a vice president who does so becomes the fully functioning president with his own presidency, as opposed to a caretaker president. The Twenty-fifth Amendment to the Constitution put Tyler's precedent into law in 1967. It also established a mechanism by which an intra-term vacancy in the vice presidency could be filled. Richard Nixon was the first president to fill a vacancy under this provision when he selected Gerald Ford for the office following Spiro Agnew's resignation in 1973. The following year, Ford became the second to do so when he chose Nelson Rockefeller to succeed him after he acceded to the presidency. As no mechanism existed for filling an intra-term vacancy in the vice presidency prior to 1967, the office was left vacant until filled through the next ensuing presidential election. Three presidents held another U.S. federal office after serving as president. Two presidents campaigned unsuccessfully for other U.S. state or federal elective offices after serving as president. Additionally, one former president, John Tyler, served in the government of the Confederate States during the American Civil War. Tyler served in the Provisional Confederate Congress from 1861 to 1862. He was elected to the Confederate House of Representatives in November 1861, but died before he could take his seat. ^ a b c d The presidents are numbered according to uninterrupted periods of time served by the same person. For example, George Washington served two consecutive terms and is counted as the first president (not the first and second). Upon the resignation of 37th president Richard Nixon, Gerald Ford became the 38th president even though he simply served out the remainder of Nixon's second term and was never elected to the presidency in his own right. Grover Cleveland was both the 22nd president and the 24th president because his two terms were not consecutive. A vice president who temporarily becomes acting president under the Twenty-fifth Amendment to the Constitution is not counted, because the president remains in office during such a period. ^ Listed here is the most recent office (either with a U.S. state, the federal government, or a private corporation) held by the individual prior to becoming president. ^ Three presidents are counted above with multiple political affiliations: John Tyler (Whig, Unaffiliated), Abraham Lincoln (Republican, National Union), and Andrew Johnson (National Union, Democratic). ^ Due to logistical delays, instead of being inaugurated on March 4, 1789, the date scheduled for operations of the federal government under the new Constitution to begin, Washington's first inauguration was held 1 month and 26 days later. As a result, his first term was only 1,404 days long (as opposed to the usual 1,461), and was the shortest term for a U.S. president who served a full term. ^ Political parties had not been anticipated when the Constitution was drafted in 1787 and ratified in 1788, nor did they exist at the time of the first presidential election in 1788–89. When they did develop, during Washington's first term, Adams joined the faction that became the Federalist Party. The elections of 1792 were the first ones in the United States that were contested on anything resembling a partisan basis. ^ Due to logistical delays, Adams assumed the office of Vice President 1 month and 17 days after the March 4, 1789 scheduled start of operations of the new government under the Constitution. As a result, his first term was only 1,413 days long, and was the shortest term for a U.S. vice president who served a full term. ^ The 1796 presidential election was the first contested American presidential election and the only one in which a president and vice president were elected from opposing political parties. 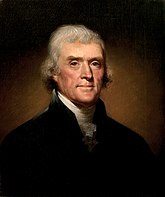 Federalist John Adams was elected president, and Jefferson of the Democratic-Republicans was elected vice president. ^ John Calhoun, formerly a Democratic-Republican, founded the Nullifier Party in 1828 to oppose the Tariff of 1828 and advance the cause of states' rights, but was brought on as Andrew Jackson's running mate in the 1828 presidential election in an effort to broaden the democratic coalition led by Jackson. ^ John Tyler was sworn in as president on April 6, 1841. 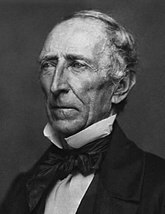 ^ John Tyler, a former Democrat, ran for vice president on the Whig Party ticket with Harrison in 1840. Tyler's policy priorities as president soon proved to be opposed to most of the Whig agenda, and he was expelled from the party in September 1841. ^ Millard Fillmore was sworn in as president on July 10, 1850. 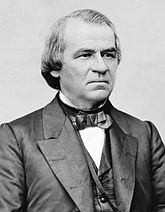 ^ Democrat Andrew Johnson ran for vice president on the National Union Party ticket with Republican Abraham Lincoln in 1864. Later, while president, Johnson tried and failed to build a party of loyalists under the National Union banner. 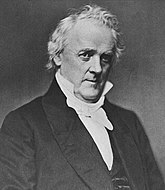 Near the end of his presidency, Johnson rejoined the Democratic Party. 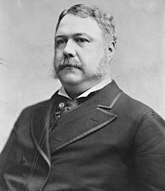 ^ Chester A. Arthur was initially sworn in as president on September 20, 1881, and then again on September 22. ^ Calvin Coolidge was initially sworn in as president on August 3, 1923, and then again on August 21. ^ The Twentieth Amendment to the United States Constitution (ratified on January 23, 1933) moved Inauguration Day from March 4 to January 20, beginning in 1937. As a result, Garner's first term in office was 1 month and 12 days shorter than a normal term. ^ "The Constitution: Amendments 11–27". U.S. National Archives & Records Administration. Retrieved October 1, 2008. ^ a b Jamison, Dennis (December 31, 2014). "George Washington's views on political parties in America". The Washington Times. Retrieved July 1, 2016. ^ "George Washington". whitehouse.gov. March 12, 2007. Retrieved January 22, 2017. ^ "George Washington". History.com. A&E Networks. Retrieved January 18, 2017. 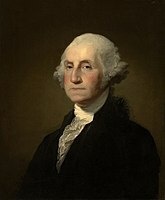 ^ "Life Portrait of George Washington". American Presidents: Life Portraits. C-SPAN. Retrieved March 6, 2016. ^ "John Adams". whitehouse.gov. March 12, 2007. Retrieved January 22, 2017. ^ "John Adams". History. Retrieved November 21, 2016. ^ "Thomas Jefferson". whitehouse.gov. March 12, 2007. Retrieved January 22, 2017. ^ "Thomas Jefferson". History.com. A&E Networks. Retrieved January 18, 2017. ^ "James Madison". whitehouse.gov. March 12, 2007. Retrieved January 22, 2017. ^ "James Madison". History.com. A&E Networks. Retrieved January 18, 2017. ^ "Life Portrait of James Madison". American Presidents: Life Portrait. C-SPAN. Retrieved March 6, 2016. ^ "James Monroe". whitehouse.gov. March 12, 2007. Retrieved January 22, 2017. ^ "James Monroe". History.com. A&E Networks. Retrieved January 18, 2017. ^ "Life Portrait of James Monroe". American Presidents: Life Portrait. C-SPAN. Retrieved March 6, 2016. ^ "John Quincy Adams". whitehouse.gov. March 12, 2007. Retrieved January 22, 2017. ^ "John Quincy Adams". History.com. A&E Networks. Retrieved January 18, 2017. ^ "Life Portrait of John Quincy Adams". American Presidents: Life Portrait. C-SPAN. Retrieved March 6, 2016. ^ "Andrew Jackson". whitehouse.gov. March 12, 2007. Retrieved January 22, 2017. ^ "Andrew Jackson". History.com. A&E Networks. Retrieved January 18, 2017. 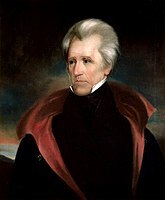 ^ "Life Portrait of Andrew Jackson". American Presidents: Life Portrait. C-SPAN. Retrieved March 6, 2016. ^ "Martin Van Buren". whitehouse.gov. March 12, 2007. Retrieved January 22, 2017. ^ "Martin Van Buren". History.com. A&E Networks. Retrieved January 18, 2017. ^ "William Henry Harrison". whitehouse.gov. March 12, 2007. Retrieved January 22, 2017. ^ "William Henry Harrison". History.com. A&E Networks. Retrieved January 18, 2017. ^ "Life Portrait of William Henry Harrison". American Presidents: Life Portrait. C-SPAN. Retrieved March 6, 2016. ^ "John Tyler". whitehouse.gov. March 12, 2007. Retrieved January 22, 2017. ^ "John Tyler". History.com. A&E Networks. Retrieved January 18, 2017. ^ "James K. Polk". whitehouse.gov. March 12, 2007. Retrieved January 22, 2017. ^ "James K. Polk". History.com. A&E Networks. Retrieved January 18, 2017. ^ "Life Portrait of James K. Polk". American Presidents: Life Portrait. C-SPAN. Retrieved March 6, 2016. ^ "Zachary Taylor". whitehouse.gov. March 12, 2007. Retrieved January 22, 2017. ^ "Zachary Taylor". History.com. A&E Networks. Retrieved January 18, 2017. ^ "Life Portrait of Zachary Taylor". American Presidents: Life Portrait. C-SPAN. Retrieved March 6, 2016. ^ "Millard Fillmore". whitehouse.gov. March 12, 2007. Retrieved January 22, 2017. ^ "Millard Fillmore". History.com. A&E Networks. Retrieved January 18, 2017. ^ "Franklin Pierce". whitehouse.gov. March 12, 2007. Retrieved January 22, 2017. ^ "Franklin Pierce". History.com. A&E Networks. Retrieved January 18, 2017. ^ "Life Portrait of Franklin Pierce". American Presidents: Life Portrait. C-SPAN. Retrieved March 6, 2016. ^ "James Buchanan". whitehouse.gov. March 12, 2007. Retrieved January 22, 2017. ^ "James Buchanan". History.com. A&E Networks. Retrieved January 18, 2017. ^ "Life Portrait of James Buchanan". American Presidents: Life Portrait. C-SPAN. Retrieved March 6, 2016. ^ "Abraham Lincoln". whitehouse.gov. March 12, 2007. Retrieved January 22, 2017. ^ "Abraham Lincoln". History.com. A&E Networks. Retrieved January 18, 2017. ^ "Life Portrait of Abraham Lincoln". American Presidents: Life Portrait. C-SPAN. Retrieved March 6, 2016. ^ "Andrew Johnson". whitehouse.gov. March 12, 2007. Retrieved January 22, 2017. ^ "Andrew Johnson". History.com. A&E Networks. Retrieved January 18, 2017. ^ "Ulysses S. Grant". whitehouse.gov. March 12, 2007. Retrieved January 22, 2017. ^ "Ulysses S. Grant". History.com. A&E Networks. Retrieved January 18, 2017. ^ "Life Portrait of Ulysses S. Grant". American Presidents: Life Portrait. C-SPAN. Retrieved March 6, 2016. ^ "Rutherford B. Hayes". whitehouse.gov. March 12, 2007. Retrieved January 22, 2017. ^ "Rutherford B. Hayes". History.com. A&E Networks. Retrieved January 18, 2017. ^ "Life Portrait of Rutherford B. Hayes". American Presidents: Life Portrait. C-SPAN. Retrieved March 6, 2016. ^ "James Garfield". whitehouse.gov. March 12, 2007. Retrieved January 22, 2017. ^ "James A. Garfield". History.com. A&E Networks. Retrieved January 18, 2017. ^ "Life Portrait of James Garfield". American Presidents: Life Portrait. C-SPAN. Retrieved March 6, 2016. ^ "Chester A. Arthur". whitehouse.gov. March 12, 2007. Retrieved January 22, 2017. ^ "Chester A. Arthur". History.com. A&E Networks. Retrieved January 18, 2017. ^ a b "Grover Cleveland". History.com. A&E Networks. Retrieved January 18, 2017. ^ a b "Life Portrait of Grover Cleveland". American Presidents: Life Portrait. C-SPAN. Retrieved March 6, 2016. ^ "Benjamin Harrison". whitehouse.gov. March 12, 2007. Retrieved January 22, 2017. ^ "Benjamin Harrison". History.com. A&E Networks. Retrieved January 18, 2017. 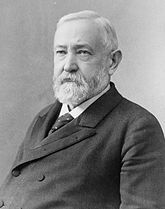 ^ "Life Portrait of Benjamin Harrison". American Presidents: Life Portrait. C-SPAN. Retrieved March 6, 2016. ^ "William McKinley". whitehouse.gov. March 12, 2007. Retrieved January 22, 2017. ^ "William McKinley". History.com. A&E Networks. Retrieved January 18, 2017. ^ "Life Portrait of William McKinley". American Presidents: Life Portrait. C-SPAN. Retrieved March 6, 2016. ^ "Theodore Roosevelt". whitehouse.gov. March 12, 2007. Retrieved January 22, 2017. ^ "Theodore Roosevelt". History.com. A&E Networks. Retrieved January 18, 2017. ^ "William Howard Taft". whitehouse.gov. March 13, 2007. Retrieved January 22, 2017. ^ "William Howard Taft". History.com. A&E Networks. Retrieved January 18, 2017. ^ "Life Portrait of William Howard Taft". American Presidents: Life Portrait. C-SPAN. Retrieved March 6, 2016. ^ "Woodrow Wilson". whitehouse.gov. March 13, 2007. Retrieved January 22, 2017. ^ "Woodrow Wilson". History.com. A&E Networks. Retrieved January 18, 2017. ^ "Life Portrait of Woodrow Wilson". American Presidents: Life Portrait. C-SPAN. Retrieved March 6, 2016. ^ "Warren G. Harding". whitehouse.gov. March 12, 2007. Retrieved January 22, 2017. ^ "Warren G. Harding". History.com. A&E Networks. Retrieved November 27, 2016. 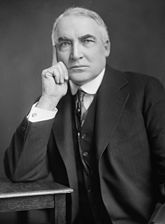 ^ "Life Portrait of Warren G. Harding". American Presidents: Life Portrait. C-SPAN. Retrieved March 6, 2016. ^ "Calvin Coolidge". whitehouse.gov. March 13, 2007. Retrieved January 22, 2017. ^ "Calvin Coolidge". History.com. A&E Networks. Retrieved January 18, 2017. ^ "Herbert Hoover". whitehouse.gov. March 13, 2007. Retrieved January 22, 2017. ^ "Herbert Hoover". History.com. A&E Networks. Retrieved January 18, 2017. 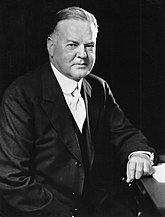 ^ "Life Portrait of Herbert Hoover". American Presidents: Life Portrait. C-SPAN. Retrieved March 6, 2016. ^ "Franklin D. Roosevelt". whitehouse.gov. March 20, 2007. Retrieved January 22, 2017. ^ "Franklin D. Roosevelt". History.com. A&E Networks. Retrieved January 18, 2017. ^ "Life Portrait of Franklin D. Roosevelt". American Presidents: Life Portrait. C-SPAN. Retrieved March 6, 2016. ^ "Harry S. Truman". whitehouse.gov. March 12, 2007. Retrieved January 22, 2017. ^ "Harry Truman". History.com. A&E Networks. Retrieved January 18, 2017. ^ "Dwight D. Eisenhower". whitehouse.gov. March 12, 2007. Retrieved January 22, 2017. ^ "Dwight D. Eisenhower". History.com. A&E Networks. Retrieved January 18, 2017. ^ "Life Portrait of Dwight D. Eisenhower". American Presidents: Life Portrait. C-SPAN. Retrieved March 7, 2016. ^ "John F. Kennedy". whitehouse.gov. March 12, 2007. Retrieved January 22, 2017. ^ "John F. Kennedy". History.com. A&E Networks. Retrieved January 18, 2017. ^ "Life Portrait of John F. Kennedy". American Presidents: Life Portrait. C-SPAN. Retrieved March 7, 2016. ^ "Lyndon B. Johnson". History.com. A&E Networks. Retrieved January 18, 2017. ^ "Richard M. Nixon". whitehouse.gov. March 12, 2007. Retrieved January 22, 2017. ^ "Richard M. Nixon". History.com. A&E Networks. Retrieved January 18, 2017. ^ "Gerald R. Ford". whitehouse.gov. March 12, 2007. Retrieved January 22, 2017. ^ "Gerald Ford". History.com. A&E Networks. Retrieved January 18, 2017. ^ "James Carter". whitehouse.gov. March 12, 2007. Retrieved January 22, 2017. ^ "Jimmy Carter". History.com. A&E Networks. Retrieved January 18, 2017. ^ "Life Portrait of Jimmy Carter". American Presidents: Life Portrait. C-SPAN. Retrieved March 7, 2016. 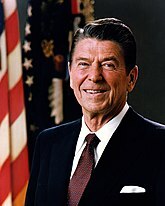 ^ "Ronald Reagan". whitehouse.gov. June 25, 2008. Retrieved January 22, 2017. ^ "Ronald Reagan". History.com. A&E Networks. Retrieved January 18, 2017. ^ "Life Portrait of Ronald Reagan". American Presidents: Life Portrait. C-SPAN. Retrieved March 7, 2016. 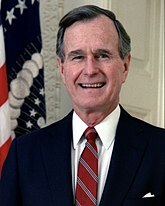 ^ "George H. W. Bush". whitehouse.gov. March 12, 2007. Retrieved January 22, 2017. ^ "George Bush". History.com. A&E Networks. Retrieved November 27, 2016. ^ "William J. Clinton". whitehouse.gov. March 12, 2007. Retrieved January 22, 2017. ^ "Bill Clinton". History.com. A&E Networks. Retrieved November 27, 2016. ^ "Life Portrait of Bill Clinton". American Presidents: Life Portrait. C-SPAN. Retrieved March 7, 2016. ^ "George W. Bush". whitehouse.gov. February 25, 2007. Retrieved January 22, 2017. ^ "George W. Bush". History.com. A&E Networks. Retrieved November 27, 2016. ^ "Barack Obama". whitehouse.gov. January 20, 2017. Retrieved January 22, 2017. ^ "Barack Obama". History.com. A&E Networks. Retrieved November 27, 2016. ^ "President Donald J. Trump". whitehouse.gov. January 20, 2017. Retrieved January 22, 2017. ^ "Donald Trump". History.com. A&E Networks. Retrieved January 20, 2017.